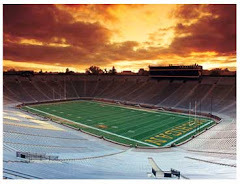 This weekends top Big Ten game is in the Big House, so we will have to look elsewhere for the Game of the Week. Last week I didn't have a good week with my picks after Iowa's QB Stanley forgot to show up in Happy Valley and the Purdue team that beat OSU the week before didn't travel to East Lansing. Maybe it will get better this week, maybe it won't!